These Customized Dominoes Sets are available in Metal Cases, Wood Boxes, and Vinyl Cases. Our Metal Case Domino Sets and Laser Engraved Wooden Dominoes Sets are available with Double Six or Double Nine Dominoes, and they feature your logo on the top of the sets. Our Imprinted Wooden Domino Boxes and Vinyl Case Domino Sets are available with your logo custom printed on the top of the cases and on each individual tile. The Minimum Order is 25 Dominoes Sets for Our Metal Cases and Engraved Wood Cases, and 50 Dominoes Sets for Our Imprinted Wood and Vinyl Cases. 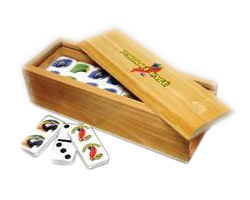 For additional information on any of our Customized Dominoes Sets, please contact us at 1-800-233-0828. You might also be interested in our Custom Dice Cups Sets, Custom Playing Cards, and Custom Poker Chip Sets.